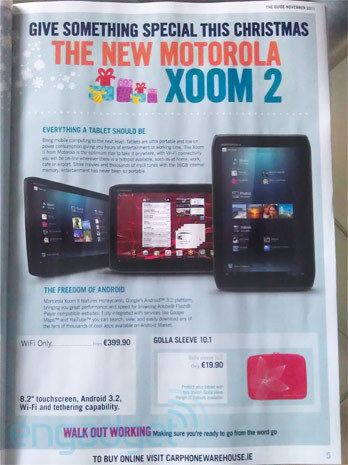 An advertisement depicting the Motorola XOOM 2 has been spotted on a flyer for Car Phone Warehouse based out of Ireland. The 16GB Wi-Fi only version will be going for 399.99 Euros, which will equate to about $545 in US dollars. This version of the XOOM 2 has an 8.2″ display powered with Android 3.2, which is sure to get the bump to Ice Cream Sandwich later down the road – still not to be confused by its 10.1″ counterpart that is said to boast 4G LTE and 64GB of storage. So which of these versions has you more excited? The 64GB 4G LTE beast, or the smaller, sleeker 8.2″ version?